Looking to give back this holiday season? Look no further! 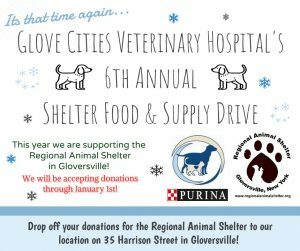 Donate to Glove Cities Veterinary Hospital’s 6th Annual Shelter Food and Supply Drive! This year we will be supporting the Regional Animal Shelter in Gloversville. Drop off your donations to our location on 35 Harrison Street in Gloversville. We have also partnered with Purina! If we get 45 donations they will donate an additional 150lbs of food. Drop off your donations today and help support our shelter pets! Charlie has a message for you!